Paul Tisdale was happy with his side's efforts as they came from behind to draw with Stevenage at Stadium MK. 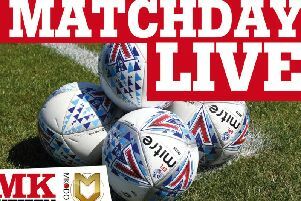 Chuks Aneke's tap in six minutes from time cancelled out Ilias Chair's 30th minute strike from range as Dons moved back up into the automatic promotion spots. "I'm happy with a point," he said. "I felt we did well today, came back in to it strong. We didn't deserve to win it, but overall I'm happy. "I think we put a lot of pressure on, you have to hand it to Stevenage for defending tightly and strongly, but I'm pleased with how we got back in it. I haven't got too many grumbles. It's a point picked up with eight games to go. "Between now and the end of the season, there will be days where we're there because we win in a few games in succession. There will also be games we don't win and it's not over yet. We've got eight games to go, we've got a good point. "Apart from the goal, they didn't really trouble us but the goal gave them something to hold on to. "We worked a pattern from half time to get the goal and continued to try and get the second. I'm proud of the players' efforts. We've developed and there are signs of something new from two or three months ago." After a defensive injury crisis of late, Tisdale was able to introduce Baily Cargill and Mathieu Baudry back into the starting line-up. But Dons were hit with injuries, with David Wheeler coming off in the opening half with a facial injury and Cargill on a stretcher in the second period, Tisdale eased worries on Baudry, who was withdrawn at the break. He said: "Mathieu was tactical. Baily was injured, I believe he headed the ball and didn't get up again. We'll have to assess it but it just seems to be our luck at the moment. "I'm not sure where (Wheeler's) teeth are – it was a nasty body block. His teeth have been damaged, it's not a nice one for him."